The Australian Government is focused on building a more effective and efficient vocational education and training (VET) system delivering job-ready skills that employers want. To meet this goal, the VET Reform Taskforce in the Department of Industry has been actively working with stakeholders over the last few months via state and territory-based workshops and webinars to hear the views of industry, employers, students, training providers and VET service providers on the strengths and weaknesses of the VET system, and ideas for reform. In total, its face-to-face workshops and webinars in March and April reached over 3000 people. Summaries of each state/territory workshop will be on the VET reform website shortly. reducing the burden on the VET sector arising from the constant updates to training packages. Outcomes of the meeting can be found in the communique. For more information, visit the VET reform website, email the VET Reform Taskforce or phone 13 38 73. The Unique Student Identifier is almost here – be ready! With the Student Identifier Bill 2014 reintroduced into Parliament on 27 March, the Unique Student Identifier (USI) initiative is back on track for full implementation from 1 January 2015. In 2015, nearly 5000 public and private registered training organisations (RTOs) will be collecting data for an estimated 3 million students for the national data collection. The USI will put students at the centre of a big step in improving the value of this data. It will provide students with access to and control over their future training records and help to streamline data exchange between students, training providers and other relevant stakeholders. The key to smooth implementation will be early preparation for RTOs. To help RTOs, their staff and students prepare for introduction of the USI, the USI Taskforce will be providing information, answering questions, trialling and supplying supporting materials and tools progressively over the next nine months leading up to full implementation. Third party testing of the USI system for SMS vendors and in-house IT developers is also available now! Take this opportunity to test your systems for web service authentication, connectivity and functionality with the USI system. Email the USI Taskforce if you’d like to be involved. The USI system will be available before full implementation and RTOs and students are encouraged to begin applying for and collecting USIs ahead of the formal commencement date. For more information on the USI initiative, please visit the USI website. Applications are now open for the 2015 round of the Department of Education’s student mobility programs. These programs provide grants to Australian students to undertake a study experience overseas as part of their course. Around 5400 students are being supported through these programs in 2014, including around 1000 VET students. Australian higher education and public and private RTOs can apply for funding for their students. AsiaBound Grants Program (AsiaBound). Asia focussed. Includes AsiaBound VET which provides grants for short-term projects for VET students studying at Certificate IV and above. Vocational Education and Training Outbound Mobility Program (VET Outbound). Provides grants for short-term projects for VET students studying at Certificate IV and above. Study Overseas Short-term Mobility Program (STMP). Details of the programs and eligibility can be found in the guidelines. Any other enquiries can be directed to the Department’s student mobility team. The closing date for submission of applications is Monday 16 June 2014. 2014 Australian Training Awards applications are closing soon! International Training Provider of the Year Award*. Applications for the above direct entry categories close on Friday 30 May 2013. For more information on all awards to be presented at the 2014 Australian Training Awards, visit the website or phone 13 38 73. A short video discussing the Awards process, as well as interviews with some 2013 winners, is now available on You Tube. * Applications for this award are made directly to the Australian Training Awards in all states except Western Australia where applications must be made to the WA Training Awards. This year’s Australian Training Awards will be held in Adelaide on 21 November 2014. For regular updates about the Australian Training Awards, please follow the Australian Training Awards on Twitter @AusTrainAwards. In 2010 the Chinese Government received funding from APEC to launch the APEC Skills Development Promotion Project (2010-2014). One of the key activities of this project is the biennial APEC Youth Skills Camps in China. improving the attractiveness of vocational training to APEC youth and promoting the development of APEC youth skills. Following the success of the first camp in 2012, the 2nd APEC Youth Skills Camp will be held in Beijing, Zhengzhou and Guangzhou from 21–30 May 2014 with the theme Investing in Youth Skills for a Better Future. Jessica Taggart (NSW), finalist - 2012 Australian School-based Apprentice of the Year (Health Services Assistance). Accompanied by Jacky Cheng from Western Australia, the winner of the 2013 Teacher/Trainer of the Year (Visual Arts), the group will participate in a mix of cultural activities (including the Great Wall, and visiting a Shaolin Temple), visits to vocational training schools and the China World Skills training facility and group activities. Their attendance at the camp is fully funded by APEC, and organised by the Department of Industry. This is a fantastic opportunity for Australia and the Australian VET system to be represented in our region by our top VET students and trainer. An updated set of technical standards for creating accessible and reusable e-learning content has been published for the vocational education and training (VET) sector. The annual e-standards review was undertaken by the New Generation Technologies business activity on behalf of the National VET E-learning Strategy. More information on the updated standards is available on the website of the Flexible Learning Advisory Group. 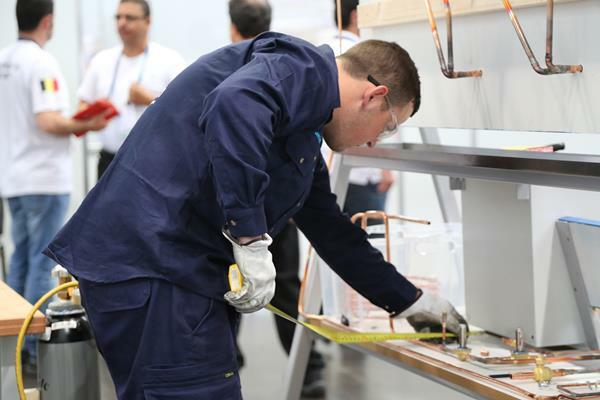 Ten of Australia’s best refrigeration technicians from across the country have earned their position to compete at the 2014 WorldSkills Australia National Refrigeration Competition following their medal-winning performances in the 2013 round of regional competitions. Returning to Melbourne in 2014, the National Refrigeration Competition will be held in conjunction with Australia’s only international air conditioning, refrigeration and building services (ARBS) exhibition at the Melbourne Convention and Exhibition Centre from 20–22 May. The national competitors will be judged on a series of detailed criteria such as accuracy and timing, by a cohort of national experts in the industry. 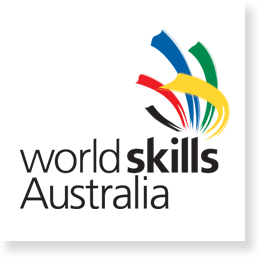 In addition to battling it out for the prestigious gold medal, the competitors will also be vying for a coveted position as a member of the 2015 Team Australia Skillaroos, where they will go on to compete at the 43rd WorldSkills International Competition being held in São Paulo, Brazil, in August next year. The medallists of the National Refrigeration Competition will be announced at the official presentation ceremony, to be held on 22 May. Find out who will be crowned the 2014 national champion by staying tuned to the WorldSkills Australia website. St George Illawarra Dragons forward Bronson Harrison will promote Australian Apprenticeships as a viable career option after signing-up as an Australian Apprenticeships Ambassador for the Australian Government. Bronson has played more than 180 matches with the Wests Tigers, Canberra Raiders and the Dragons and employs two Australian Apprentices at Lee Bryce Construction, a company he owns with his brother Cheyne. 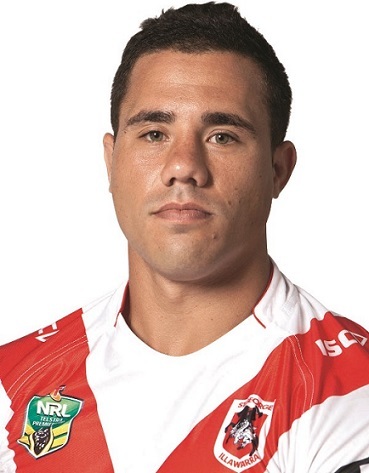 The 28-year-old has also recently taken over the role of Apprentice Mentor at the Dragons in the National Rugby League’s Trade Up with the NRL program. “My experience in employing two of my own Australian Apprentices puts me in a good position to offer guidance and advice to Dragons players,” Bronson said. “Australian Apprenticeships provide great learning opportunities and the tools to have a successful life. Bronson joins a number of other NRL players who are Australian Apprenticeships Ambassadors including Andrew Ryan, David Tyrrell, Matt Ballin and Bryan Norrie – as well as other high-profile ambassadors including Neil Perry, Kevin Sheedy, Scott Cam and Renya Xydis. Bronson said the aim of the Trade Up with the NRL program was to ensure young players developed skills needed away from the field and became respected people away from rugby league. You can read the real-life success stories of more than 120 Australian Apprenticeships Ambassadors from across Australia on the Australian Apprenticeships website, ‘like’ Australian Apprenticeships Ambassadors on Facebook and follow @AusApprentice on Twitter. Congratulations to Australian Apprenticeships Ambassador Scott Cam who won the 2014 Gold Logie Award for his role as host of Channel Nine’s The Block. 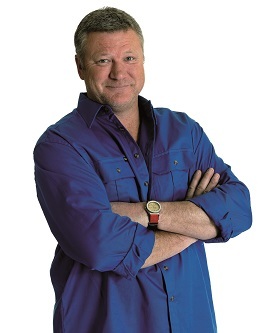 Scott also took home a Silver Logie for Most Popular Television Presenter. The television personality, who started his career as an Australian Apprentice in the carpentry trade with his older brother, said he would hollow out the bottom of the trophy and turn it into a stubby holder. You can read Scott’s Australian Apprenticeships success story as well as his recent post about the role of Australian Apprentices on The Block. Staying Connected in VET eZine launches! Velg Training has launched the first edition of its biannual online magazine, Staying Connected in VET eZine, a publication to educate, inspire and empower Australia’s vocational education and training (VET) sector. It is a full-colour, responsive and engaging publication that will take you through the next few months of changes to the VET sector. The publication is hosted online via Issuu, where readers can download, email or share via their social media networks. For more information and to access your complimentary copy, please visit Velg's website. iNotice is a free, easy to use app designed for care workers and caregivers working to a care plan supporting a person to stay safely in a home environment. iNotice will assist to heighten awareness of a variety of signs and symptoms that may be linked to a person’s medication management. The app supports the early recognition of indicators and provides relevant prompts. For care workers there is additional guidance about what action may be taken within their scope of practice and their organisation’s policies and procedures. iNotice includes an iPractice feature which comprises realistic home care scenarios to encourage app practice to learn more about common signs and symptoms and the appropriate actions needed. Users should carefully evaluate all content for their own purpose. Information contained in this app is not to be used as a substitute for medical or professional health care advice or to diagnose, treat or cure any health related symptom. It contains information to ‘trigger’ or heighten awareness for care workers and caregivers. iNotice may be downloaded for free from the App Store for iPhone or iPod touch and from Google Play™ for Android™. This app has been developed by NSW Community Services & Health Industry Training Advisory Body and Aged & Community Services NSW & ACT. The project was possible due the funding made available by Health Workforce Australia, an Australian Government initiative. Read more about Build Green on eWorks' website. An accessible modern video player, with alternatives for older browsers, is now available, thanks to the expansion of a National VET E-learning Strategy emerging technology trial. Over two years, Victoria’s Kangan Institute undertook a two-stage trial that resulted in the creation of an HTML5 video player that warranted further development towards WCAG 2 AA (accessibility) compliance. Late in 2013, Kangan Institute and the Strategy’s E-standards Experts Group collaborated to further develop the video player to be keyboard and screen reader accessible, and enabling the viewer to change colour contrast and typeface for closed captions. Further information is available on the Strategy’s website. 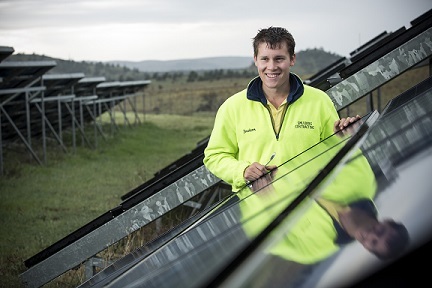 How does an Australian Apprenticeship lead to a rewarding career? Do you know someone who is weighing up their career options? Tell them to check out the fantastic personal stories of more than 120 Australian Apprenticeships Ambassadors who have found career and personal success through completing an Australian Apprenticeship. To learn about the amazing opportunities an Australian Apprenticeship can provide, like Australian Apprenticeships Ambassadors on Facebook and follow @AusApprentice on Twitter. You might even see some well-known faces! SkillsDMC RII Resources and Infrastructure Industry training package workshops - book now! In November 2013 the RII Resources and Infrastructure Industry training package transitioned to the new Standards for Training Packages. Since the transition SkillsDMC has fielded a large number of enquiries about changes that were made and their impact on implementing the training package. In recognition of this need, an implementation workshop has been developed to provide stakeholders with information about the changes and guidance on how to implement them in training and assessment practice. The workshops will discuss how the Standards for Training Packages have been applied in the development of RII and will provide practical strategies that trainers and assessors can use to meet the assessment requirements. They will also present a series of case studies that demonstrate how strong partnerships between enterprises and training providers have led to improved workforce development outcomes. Workshops are being conducted in all state and territory capital cities during May and June 2014. Places are limited so book now to secure your seat. More information is available on the SkillsDMC Events Page. Jadon Tree hopes his success as an Australian School-based Apprentice will inspire other Aboriginal and Torres Strait Islander students to pursue their dreams. The 18-year-old was a national finalist at the 2013 Australian Training Awards after winning South Australia’s School-based Apprentice of the Year award. He is midway through his Australian Apprenticeship and is on-track to gain a Certificate III in Electrotechnology with TAFE SA. “Being able to succeed through my Australian School-based Apprenticeship gives a lot of people hope, especially being a kid from the country with not many opportunities,” Jadon said. “When I finished secondary school, I had already been working for a year and had a job thanks to my Australian School-based Apprenticeship. “It is only four years to do a trade and you always have that qualification to fall back on. Jadon is aiming to complete his Certificate III before deciding on his future. “There are many possibilities once I have completed my apprenticeship – whether I want to further myself as an electrician, dual-trade in other areas such as instrumentation or refrigeration, or go to university and complete an electrical engineering degree,” he said. Jadon recently signed-up as an Australian Apprenticeships Ambassador for the Australian Government. Ryan Grant will be a fully-qualified chef only months after turning 18. The Gold Coast resident started his Australian School-based Apprenticeship in Year 10 and worked six evenings a week while completing secondary school at Marymount College and theoretical training through Kings Unitech. The hard-work paid off, with Ryan on the verge of gaining his qualification while others his age are only just starting an Australian Apprenticeship or university studies. Ryan is also an Australian Apprenticeships Ambassador. “My experience proves that an Australian School-based Apprenticeship puts you ahead of the pack,” Ryan said. Ryan works for renowned chef Daniel Ridgeway at Little Truffle Restaurant – an experience that saw him named Queensland’s School-based Apprentice of the Year and then a finalist at the 2013 Australian Training Awards. “I believe it is important for chefs to enter competitions from a young age – it allows you to benchmark your skills and can give you great recognition,” he said. 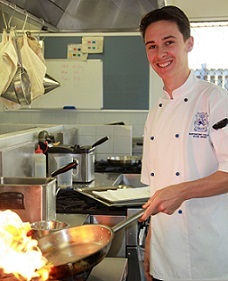 Alexander Dagger does not think of himself as being outstanding despite being an Australian School-based Apprentice of the Year finalist at the 2013 Australian Training Awards. He is now reaping the rewards of his Australian School-based Apprenticeship, which has helped him secure placement with the Royal Australian Air Force. “I wanted an early start to my career and I knew exactly what I wanted to do,” Alexander said. The former Epping Boys High School student is completing a Certificate IV in Telecommunications Networks Technology with employer Kordia Solutions and TAFE NSW – South Western Sydney Institute. The role sees Alexander working across Sydney and surrounding regions such as Wollongong and the Central Coast. “Working in telecommunications really interests me because no two days are the same,” he said. “During my apprenticeship, I have worked on 30 storey high buildings and 90 metre high telecommunications towers. Alexander is an Australian Apprenticeships Ambassador. This is a new section of our newsletter where we will feature Australians who have achieved personal and or career success as a direct result of their studies in the vocational education and training sector. If you know of someone who may wish to share their success story with our readers, please email us at skillsatwork@industry.gov.au. Vanessa Dunstan enjoyed maths, physics and technical subjects at school. Following the birth of her first child, she secured a place at La Trobe University to study engineering. However, she found that the demands and costs of her university study were not conducive to single parenting so she started an electrician apprenticeship at Holden. Following the completion of her apprenticeship, Vanessa embraced the training opportunities Holden provided and completed two more certificates and a diploma. In 2006, she commenced tertiary engineering studies at Deakin University, balancing full time work, part time study and family responsibilities. Ten years after winning the Vocational Student of the Year award at the 2003 Australian Training Awards, Vanessa completed a Bachelor of Engineering in Robotics/Mechatronics at Deakin University. She is still working at Holden, as the Electrical Quality, Reliability and Durability Lead, and has a desire to inspire young people to pursue their goals, to not give up, and to look for alternate pathways to get to where they want to be. We asked Vanessa about her journey from apprentice electrician to mechatronics degree…..
Why did you enter the field that you did? I enjoyed physics, maths and technical subjects at school, especially one called Electrical/Electronic Practices, and a careers advisor suggested an engineering degree. I was in high school when I had my first child and was told that I would struggle to finish school, let alone have a career. I was determined to prove them wrong! I received an offer from La Trobe University to study Engineering, but I soon realised that a student budget was not enough to support both a child and myself. I looked for a job as an electrician, and secured an apprenticeship at Holden. Once I had finished my apprenticeship I took every training opportunity Holden offered and completed two more certificates and a diploma. In 2004 I joined Holden’s Electrical Engineering Group as a Technical Officer. I was finally working in the area that I had always longed to be! In 2006 I was accepted into Deakin University to pursue a Bachelor of Engineering in Robotics/Mechatronics, with Holden supporting me all the way. I finished my degree in 2013 and graduated in April. I achieved this milestone by studying part time whilst maintaining a high standard working full time within the Group. Tell us about some of the challenges you faced along the way. I had to fight the stigma that comes with being a young mum, and the assumption that I would go onto welfare benefits and not create a substantial career for myself. I juggled to find balance with my work, life and study, as I always felt guilty that I was not spending enough time with my kids and my husband. I wanted to ensure that I was a good role model for them, especially with regards to my education. I had a great support network in my friends and family. Had it not been for them, I would not have been able to do what I have done. I think that if I had done anything differently I would not be the person I am today, so in essence I would not do anything different. It was hard and I sacrificed a lot to receive my degree (having to say I can’t do something because I needed to study, going on holidays with my kids and having to do homework while they played), but it was worth it. I consider it to be more of a personal sense of satisfaction than a career achievement. What were the highlights of your journey? Personal - Having my kids and husband at my graduation ceremony last month. Work - Working on prototype vehicles and traveling overseas, working alongside great engineers. I love being part of an iconic brand and contributing to various new vehicles being released to the public. Seeing those vehicles being driven on the road and customers being excited about them is fantastic. What are you now doing in your career, and is it everything you had hoped? I am currently Holden’s Electrical QRD (Quality, Reliability, Durability) Lead. It is only early stages in this role however I enjoy learning new things and am looking forward to what lies ahead. Now that I have my degree the sky is the limit! In 2003 you mentioned that you may like to be teaching in 10 years. Do you still harbour that desire? I do still have the desire to teach, but a stronger desire is to inspire young people to pursue their end goals, to not give up, and to look for alternate ways to get where they want to. Information sessions are provided regularly around Australia to help people working with Australian Apprenticeships to get the most out of the range of resources and information available on the Australian Apprenticeships & Traineeships Information and Australian Apprenticeships Pathways websites. Staff in any network with an interest in Australian Apprenticeships are invited to attend these free sessions where new website features will be highlighted. Please book online by completing the registration form for your session of choice. For more information, call 1800 338 022 or email events@aatinfo.com.au. This service is funded by the Australian Government’s Department of Industry. Velg Training offers a professional development (PD) program using webinars to keep both members and non-members up to date on key developments in the VET sector. Velg has released its updated calendar of PD webinar events, featuring a range of topics presented online by industry experts. Register now to receive all electronic resources, including the PowerPoint, webinar recording, chat Q&A transcript and additional presenter resources within 48 hours of the session’s close. Sessions now live for registration are listed on Velg’s website, targeting VET practitioners working within registered training organisations (RTOs) and Queensland schools. Velg Training members, including all Corporate, Sibling and Individual accounts, receive discounts on Velg’s PD opportunities, with access to complimentary webinars via the exclusive Members’ Lounge online portal. VET Summit returns with a brand new format in 2014! Velg Training’s 2014 VET Summit dates have been released for registration, along with a new program format targeted at RTO staff that will allow for more in-depth content and interaction. Option 2: a combined registration allowing movement between streams, which will include video recordings for every single session (over the two streams) following the event, sent electronically. Carol Hunter, Principal of RTO Services and Consulting. This event is a pre-approved professional development opportunity as part of Service Skills Australia’s Right Way Program for trainers and assessors, and has been allocated 30 points. For more information on the 2014 VET Summit program, please visit the Summit website. The Australian Institute of Training and Development (AITD) presents the leading annual conference for training, learning and development and organisational development professionals. AITD2014 is taking place in Sydney on 14-15 May 2014 and includes optional pre- and post-conference full day workshops. Keynote speakers include Harold Jarche, Nigel Paine, Marigo Raftopolous and Tony Fiddes. Join your professional community for this significant professional development event! Mix with L&D professionals, training providers and consultants, resource providers, HR managers and employers. For more information, visit AITD's website. The Hydrocarbons Assessor Network (HAN) is now in its 10th year! The HAN began with seed funding from the (then) Reframing the Future program and is now managed by Manufacturing Skills Australia. The HAN holds two workshops each year, in May and November. The workshops provide professional development activities, validation, guest presentations and opportunities for networking and industry benchmarking. The first workshop for 2014 will be in Sydney. The network is open to enterprise and RTO personnel who are active in developing and/or delivering training and assessment in the hydrocarbons, gas and oil sectors. For eligibility and membership, please visit the website. For more information, please email Celeste Howden. Hosted by the Department of Training and Workforce Development, the Training Providers Forum 2014 will be held at Crown Perth in May. This two day conference and exhibition will provide the latest updates on training and workforce development, and showcase examples of innovation and good practice. The program features a range of high profile keynotes speakers, including Mr Andrew Forrest, chairman of the Fortescue Metals Group, as well as workshops and information sessions. It is a great professional development and networking opportunity for all training professionals. The Forum also includes an exhibition with about 40 booths featuring the most up to date information on services and products available to the VET sector. About 600 delegates from private and public training providers, Industry Training Councils and Skills Councils, schools, universities and government agencies are expected to attend. To view the program and register please visit the Forum website. The 10th SkillsDMC annual conference is a unique and valuable opportunity which will showcase how the collaboration of industry and governments continues to shape future workforce planning and development initiatives. Michael Pascoe will be the Master of Ceremonies. Michael Roche, Chief Executive of SkillsDMC's close partner, the Queensland Resources Council, will be addressing conference delegates on the morning of the conference. SkillsDMC is delighted to have Michael participating in this milestone event. Michael's experience covers a broad range of industries including economics, government and resources. In 2012 Michael was appointed by the Premier and Minister for Education, Training and Employment to chair the Queensland Skills and Training Taskforce, charged with recommending reforms to the Queensland vocational education and training sector. This initiative is the first ever industry-led review of vocational education and training in Queensland. Michael is also currently Acting Chair of the Queensland Ministerial Industry Commission on Skills, developed to provide advice to the Minister for Education, Training and Employment on Queensland's skills and workforce development priorities linked to employment outcomes and to advise government on funding priorities for qualifications matched to job opportunities. Michael is also the ambassador for the Mining and Energy Challenge, part of the Leukaemia Foundation's World's Greatest Shave fundraising initiative. The Queensland Resource Council represents the interests of more than 270 companies with direct and service sector investment in developing Queensland's minerals and energy resources. The conference program is available on SkillsDMC's website and registrations are now open. Should you have any questions regarding the conference, please contact GEMS Event Management on +61 02 9744 5252 or email Julie McGraw. The 2014 National VET Conference Program has now been released! Registration is open for Velg Training’s 2014 National VET Conference, which will be delivered over two days, providing attendees the opportunity to engage in a wide variety of plenary and elective sessions from 11-12 September 2014 at the Brisbane Convention and Exhibition Centre. The theme for this year’s event is 'Impossible is Possible Together' and will focus on bringing vocational education and training (VET) professionals together to discuss recent updates to the sector and best practices for registered training organisations (RTOs), acting as a platform for networking and collaboration. The conference will feature three distinct streams, Policy and Reform, RTO Management & Compliance and Training & Assessing. By popular demand, the Master Class elective stream will be returning in 2014. Attendees of the 2014 National VET Conference will be divided into two client groups - RTO Management and RTO Trainers and Assessors. More information about the conference, including the program, is available on Velg Training’s National Conference website. The 2013 National VET Conference attracted just over 950 attendees, making it the largest annual gathering of VET practitioners from across Australia. Registration for the 2014 National VET Conference is now open for delegates, with ‘Early Bird Catches the Worm’ pricing available until Monday 31 March 2014. You can register online. Join VETnetwork Australia for its 2014 Biennial National Conference in Darwin. The conference theme of ‘Sustainability, Skills and Strategy’ focusses on the long term future of vocational education and training (VET) in an increasingly complex educational context. Three key themes will run throughout the conference’s program - sustainability for VET practitioners, skills for VET learners and strategy for the VET sector. VETnetwork Australia looks forward to seeing you at the conference and hope you can join the Master Class which offers delegates the opportunity to be involved in the most up to date research information regarding VET in Australia and then tour one of three esteemed Northern Territory educational facilities. For more information about the conference and to register, please visit the website. The 2014 WorldSkills Australia National Competition will be held in Perth in September 2014. The three day event will see over 500 of Australia’s most talented students, trainees and apprentices, from 30 regions, battle it out for gold medal success and the prestigious title of ‘Australia’s Best’ in their chosen skill or trade. The 2014 national competitors, selected from the 2013 round of regional competition winners, will be announced soon. For more information please visit the WorldSkills Australia website. A pre-conference forum, Frameworks: do they inhibit or enhance the literacy spiral?, will be held on 2 October. The forum will focus on frameworks such as Foundation Skills, the Australian Core Skills Framework, Core Skills for Work, Core Skills for Employment and Training, Skill Sets and the VET Practitioner Capability Framework, what they are, how they fit together, and how they relate to literacy and numeracy programs and individual learners. Further conference information, keynote speaker profiles and the call for presentations, is on ACAL’s website. conVerge14 – save the date! eWorks is excited to announce that conVerge14 will take place in Melbourne in November 2014. Being the 10th (!) conVerge e-learning conference, it will be bigger and better than previous years with lots of surprises in store. Mark you diary now – this event is not to be missed! conVerge14 will offer a range of experiences from stimulating presentations to interactive workshop sessions, and plenty of opportunities to network. You will leave the conference with tangible e-learning strategies to implement back at your workplace, and knowledge of the various e-learning resources available to you. Stay tuned for this year's conference theme, early bird registrations and call for papers! For more information, visit the conVerge14 website and follow eWorks on Twitter. Australian Training Awards - save the date! Details of the venue and ticketing will be available on the website. The Queensland Department of Education, Training and Employment has developed a set of online resources to help training providers adopt inclusive practices in their training. The resources support Inclusive learning: A way forward, the Queensland Government’s plan for providing greater access to, participation in, and outcomes from vocational education and training for learners with diverse needs. training modules that are designed to develop understanding and encourage implementation of the principles and actions outlined in Inclusive learning: A way forward. The training modules can be used by pre-qualified suppliers required to offer staff continuous professional learning on inclusive practice under either the Certificate 3 Guarantee Program Policy 2013-2014 (p 10) or the Community Learning: Guidelines for funding 2014-15 (p 3). The development of the resources forms part of the Queensland Government’s Great skills. Real opportunities. five-year action plan for skills reform. The resources are available on Training Queensland's website. For more information or to provide feedback, please send an email. Ideas That Work has just released another nine new language, literacy and numeracy (LLN) videos for the What Works for LLN training and professional development video library. These new videos contain practical LLN tips and good practice examples to help build vocational trainers and assessors’ capacity to support learners with LLN needs. There are now 18 What Works videos available to view or download for free from the new What Works for LLN website. Introduction to workplace LLN series (new videos coming later in 2014). learners undertaking qualifications such as TAE40110 Certificate IV in Training and Assessment. These videos were funded under the Workplace English Language and Literacy (WELL) program by the Australian Government's Department of Industry. These free What Works for LLN resources are available for viewing and download on the Ideas That Work website. The Workplace English Language and Literacy (WELL) program provides funding for the development of resources and strategic projects to support the development of adult English language, literacy and numeracy skills aligned to accredited training packages and units of competency. WELL resources that have been developed include assessment tools, companion documents supporting the delivery of units of competency, and online and interactive learning modules. Many target Indigenous or culturally and linguistically diverse learners. WELL resources have been developed across all industries and several have received awards for best practice in resource design. A list of these resources and information about how to access them is available on the LiteracyNet website. The biannual e-newsletter, Doing WELL with WELL Resources, alerts subscribers to newly completed WELL resources. If you would like to receive this newsletter, please send an email with your contact details. Produced by the National Centre for Vocational Education Research (NCVER) and funded by the Commonwealth, state and territory governments, VOCEDplus is a free online resource offering international coverage of issues as well as an Australian focus. It currently holds over 57 000 entries, many providing instant access to full text via your desktop, with around 400 new titles added each month. Where possible, NCVER will supply items as requested according to its Conditions of Use. Bernadette Shiel, MSA Marketing and Communications Manager, on 02 9955 5500 or via email. National Skills Standards Council - provides advice on the national standards for regulation of vocational education and training. If you would like to provide feedback or supply an article for inclusion in the next edition, or join our list of subscribers, please email skillsatwork@industry.gov.au. The next edition will be published in June 2014. Submissions are due by 16 May 2014.